The item Armageddon films faq, Dale Sherman, (ebook) represents a specific, individual, material embodiment of a distinct intellectual or artistic creation found in Charlotte Mecklenburg Library. Mankind has been predicting its own demise through various methods, from fables and religious scriptures to hard-core scientific studies since the dawn of time. And if there is one thing Hollywood knows how to exploit, it is the fears of Things to Come. Movies about the end of the world have been around since the early days of cinema, and Armageddon Film FAQ is a look into the various methods we have destroyed ourselves over the years: zombies, mad computers, uptight aliens, plunging objects from space, crazed animals, Satan, God, Contagions, the ever-popular atomic bomb, sometimes even a combination of these in the same movie! 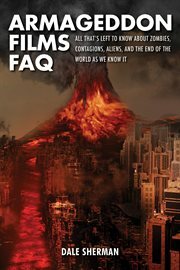 Armageddon Films FAQ goes from the silent days of filmmaking to the most recent (literally) earth-shattering epics, from cinema to television and even the novels, from comedies to dramas, from supernatural to scientific. It also explores other aspects of the genre, such as iconic but unfilmable apocalyptic novels, postnuclear car-racing flicks, domestic dramas disguised as end-of-the-world actioners, and more from the most depressing to the happiest Armageddons ever!